"I do not think there is anyone who takes quite such fierce pleasure in things being themselves as I do. "Find a crew, find a job, keep flying." but the thought sure keeps me alert, curious and very much alive. 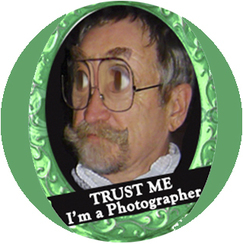 I'm a "working retired" media producer, college professor, and photographer. I live in the high pine country of east central Arizona. My back yard faces on national forest. I talk with Pigmy Nuthatches and want to know everything about everything. I spend a lot of time taking photos, and looking at photos wherever I encounter them. I have particularly enjoyed restoring old photos; especially those that have a visual mystery to solve. I'm doing less commercial photography and more restorations. I have thousands of photos going back 50years, so my plan is to reexamine them all and see what can be done with them. I've had my first gallery show and sold four prints which has inspired me beyond all reason to become an r-teest. Since I am not in a large market like Phoenix or Los Angeles, and in fact I'm on the "frontier", I did get to do just about every type of photography there is: nature, industrial, head shots, events, advertising, wild life, product, architecture, pets, pet owners, documentation, magazine covers, and an incredable spectrum of restorations and repairs. I will still do photo illustration, architectural mockups, Photoshop effects, and provide private instruction in all of that, as well as how to take nature photos. Decades ago I stopped doing weddings, studio portraits or sit down dinners. Strangely though, I did family reunions. Having obtained a 2000mm lens I am now doing a lot nature photos and experimentation. I have stashed my professional SLRs in favor of the hybrid Nikon Coolpix P520 and P900. While they have some significant limitations in low light, these cameras were science fiction when I was young. I've done a lot of community and volunteer work over the last few years - Photographer for the White Mountain Nature Center, disaster volunteer with the Red Cross as team leader for Navajo and Apache county several times over three years, event developer and board member for the White Mountain Audubon Society, Volunteer and elected member of the Board of Trustees , Pinetop Lakeside Senior Center, Vegetable chopper for the Love Kitchen, Voting Poll worker for Navajo County. For one year I was part of a project by the Intermountain West Joint Venture and Arizona Audubon to restore riparian habitat along some of Arizona's damaged streams and rivers. In late 2013 I slowed down. I was over doing it a bit and needed to balance my life in a healthier way. However, I have received so much from life that I will always support my community and nurture individuals who need encouragement and emotional support. I taught at The American Film Institute, Art Center College of Design/Pasadena, UCLA Extension (Who sent me to speak and teach in Europe), The Academy of Entertainment & Technology/Santa Monica, Cal State Northridge, and when I "retired", I had taught for eight years at the USC School of Cinema-Television, now it's called the USC School of Cinematic Arts. My classes included interactive media design, game design, media ethics, Photoshop, information structure design, cyberspace navigation design and complex production methodologies. USC was a high point in my life because I got to meet and talk with so many brilliant developers of computer and interactive media concepts, the art of film making, computer games and other media technologies as well as work with brilliant and highly motivated students. Currently I give talks on photo techniques and the history of photography as it came West for the Audobon Society. the White Mountain Nature Center, and the Pinetop-Lakeside Historical Society. I have several private clients that are learning Photoshop and photography. In 2014/15/16 taught classes on Photoshop and photography at Northland Pioneer College (NPC) in Show Low AZ. In 2016 I taught six photography courses in the Spring Semester. It had an unexpected and profound effect on my personal photography. I am now satisfied that some of my photos can be framed. Since I have seen the HUBBLE Ultra Deep Field photos, I do not share the illusions of any religion, ancient or newly revealed, pseudo science, astrology, reincarnation, the Easter Bunny, superstition, the paranormal, life after death, or alchemy. I am in awe of and extremely grateful to be living in a mysterious and incredibly beautiful Universe. I'm just happy to know where the sun goes after it goes down and that lightening is not some god expressing it's anger. I am quit content to take photographs, teach, cook and talk with Pigmy Nuthatches.